I finally was able to fly the next leg in the PilotEdge Alphabet Challenge today, which was Jacqueline Cochran (KTRM) to Kanab (KKNB). This is the fifth-longest flight in the challenge, logging in at 269.9 miles as the crows would fly it. 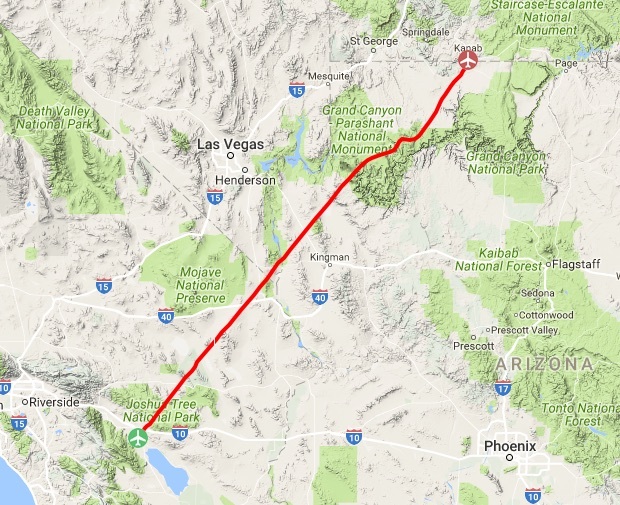 I decided to fly it using GPS navigation as VOR would have lengthened the route even more, so I had only one waypoint along the way, Grand Canyon West (K1G4). 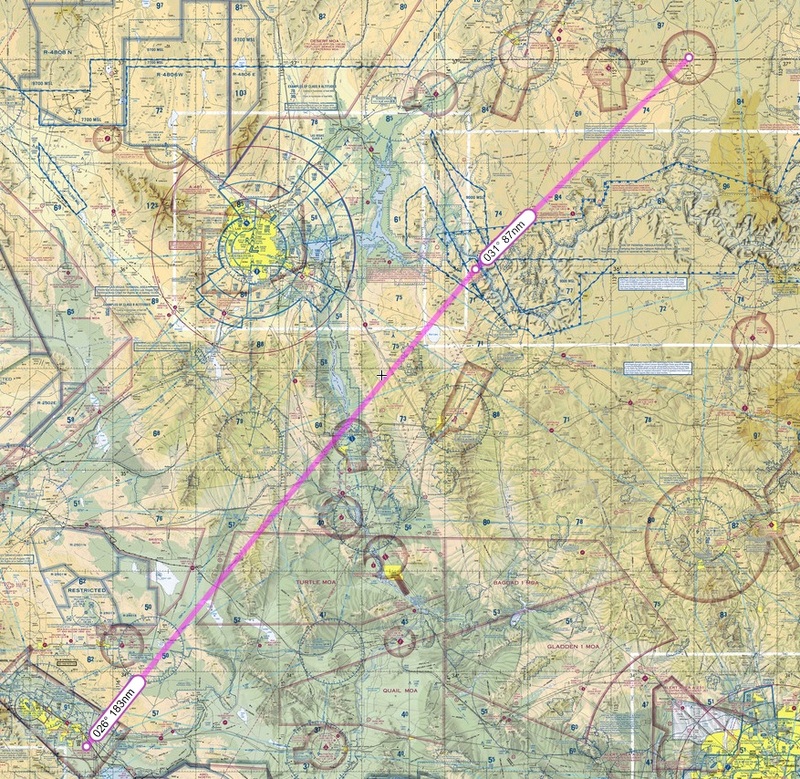 This helped make sure I stayed out of the canyon’s no-fly zones (and in that portion of the canyon airspace I needed to maintain at least 7,999 feet MSL). 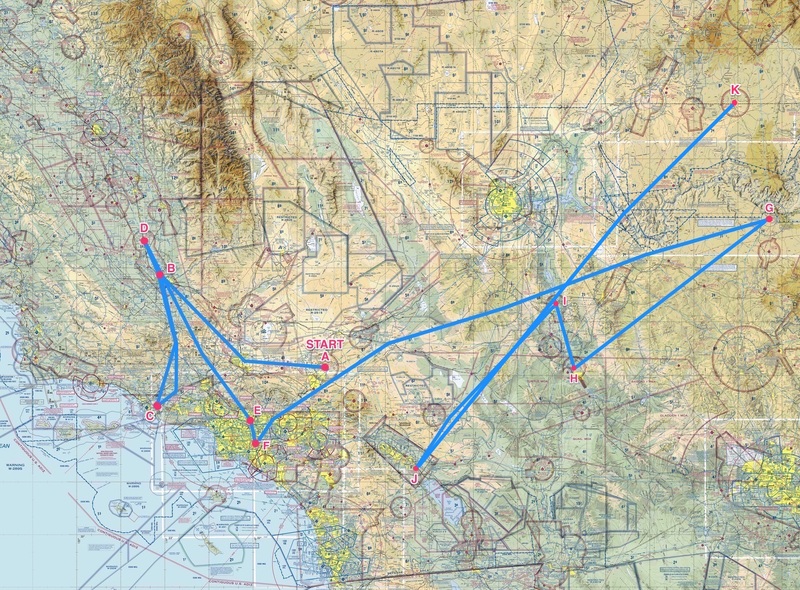 This was the only airspace consideration of note along the way, but to hone my radio skills and give me something to listen to I asked for flight following from PE SoCal approach along the way. Real World Radar Would Indicate Trouble Ahead! The flight was uneventful. I don’t use autopilot, but had no issues with heading or altitude flying the old fashioned way. Things got interesting, though, as I crossed the north rim of the canyon. At that point a simple layer of clouds (injected by Active Sky 16) pretty quickly turned into a line of thunderstorms. I was surprised by this as the weather at departure was VFR all the way. 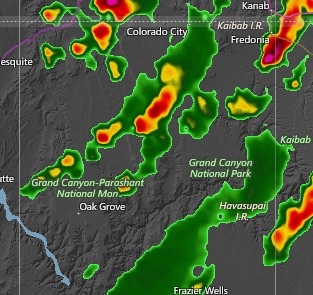 So I checked the real-world radar in ForeFlight, and sure enough: thunderstorms from me to Kanab. I switched off the GTN 750 GPS unit and turned on the REX/MilViz WX Advantage weather radar gauge and started negotiating the weather, working hard to stay below the clouds but above the 7,999 foot canyon minimum. I was quite impressed with how well AS 16 replicated the real world radar echoes. 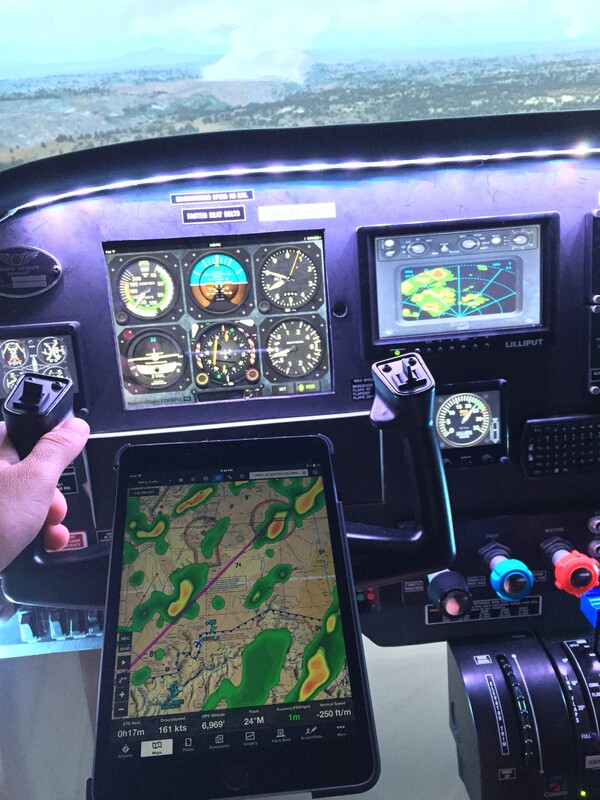 Below is a shot of the sim panel, with the iPad showing the real-world radar on ForeFlight, and the REX WX Advantage Radar in the dash showing the t-storm and rain echoes in the sim. It was really cool. Things got skinny. Finally I was able to spot some blue sky through a pass and risked the chance of a downdraft going through. In real life I don’t know that I would have made the same decision, and instead would have tried to put down at nearby Grand Canyon Bar 10. Once I was out of the altitude restriction I had more room to maneuver, and started to tack back north on a heading to Kanab. AS16 did a great job of rending the winds, turbulence, and clouds. It as all really pretty realistic and my pulse was definitely up. In the end I was able to make the landing on 19 in Kanab without further simulated incident, but it was an interesting flight a good practice for checking carb heat, holding altitude, keeping heading, etc. Here’s the planned route, and the actual route after my weather deviations. Next up: Kanab to Long Beach, the second-longest flight in the series (and only short of being the longest by a mile). And here’s the challenge progress to date.